Marketing Research Chart: Which local SEO tactics are organizations using? SUMMARY: Organic search has impacted the way consumers buy, the way business decision makers research products and now is moving even deeper into the realm of how customers find products and services in their hometown, as well. In this MarketingSherpa Chart of the Week, we explore data showing which local SEO tactics your peers are employing as they fight for traffic in this ever-growing battleground. When we asked marketers in the 2013 MarketingSherpa SEO Marketing Benchmark Survey about which types of search had the biggest impact on their organization's marketing objectives, local search was regarded as more successful than mobile search, personalized search or social search, with 54% of marketers reporting a positive impact. Q: Which of the following local search optimization tactics has your organization used? Q: Which of the following local business listing tactics has your organization used for local search? The above chart combines data from two questions. 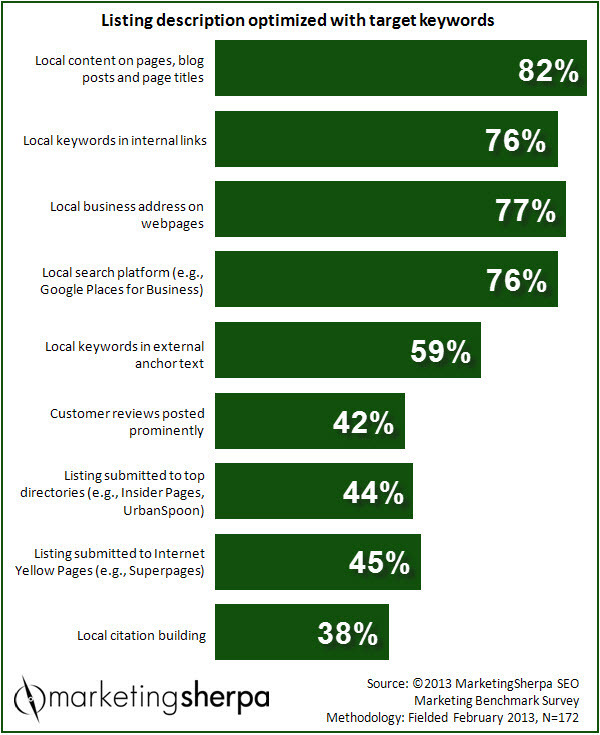 When we asked marketers which business listing tactics their organization has used for local search, 68% of marketers responded, "Listing description optimized with target keywords." This chart shows which other tactics those 68% of marketers are using as well. For example, 76% of people who have used the local business listing tactic "listing description optimized with target keywords," also have used the SEO tactic "local keywords in internal links." While more marketers are including a phone number with a local listing (79%) than optimizing their listing description based on target keywords (68%), our interest was piqued by those who are treating local search as any other form of search by targeting keywords. That is one of the main lessons from this chart. Three of the top four tactics in this chart are basic SEO tactics, simply shifting the focus of the SEO to the location. For example, content is king in local search as well — or perhaps, since the focus is local, the correct title would be baron, viscount or seigneur — with 82% of marketers responding they produce local content on pages, blog posts and page titles. Do you engage in local search engine optimization? While, as the saying goes, all politics is local, all business is not. Some businesses are best served by focusing on location-agnostic keywords, while some, particularly those with brick-and-mortar locations, live and die by foot traffic. So, do you treat local SEO as simply a new set of keywords to optimize for? Or is local important enough that you engage in tactics specifically aimed at local search such as submitting a listing to Internet Yellow Pages, directories and local review sites? Do you incorporate similar tactics you used in the print Yellow Pages? How do you determine your balance of general and local SEO efforts? By sales? Revenue? Traffic? Or just a hunch?